Do you study English and you would like to better understand when somebody asks you something? 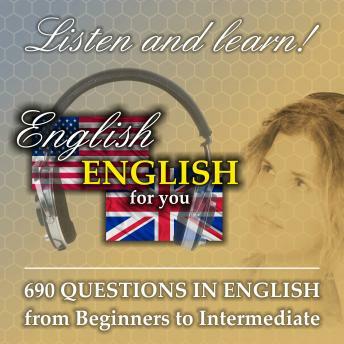 Almost 700 different questions in English can help you better understand. What do you find here? Many short English questions usually in second person like: Do you? Are you? Will you? Were you? Did you? Is he? What is? Where are? Was he? Can you? How often? Why do you? Would you like? Should I? When did you? How many? Could you? Who is? Would you like? and so on. They start with very easy and slow questions and they gradually speed up. First tens of questions are for real beginners. Then hundreds of questions are for Elementary students and last questions are for intermediate students of English. They are almost all different. You can improve your ability to understand English with these short questions.